Egypt to open its border with Gaza indefinitely after three years of closure. Israeli border to remain sealed. After three years in which Egypt's border with Gaza has remained almost completely closed, Egyptian officials announced Monday that they plan to open crossings indefinitely. The border will be open to human traffic and some humanitarian goods. The border will remain open unless there are security-related violations, an anonymous official told international media outlets. "The blockade has failed,” the official said bluntly. Attempts to pressure Hamas to release kidnapped Israeli soldier Gilad Shalit have failed as well, he said. 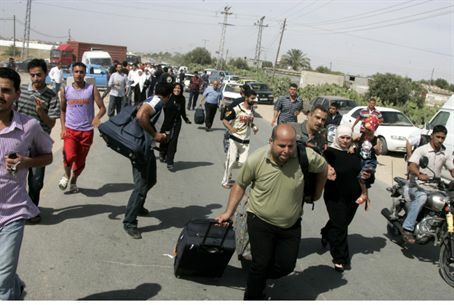 Egypt first showed signs of opening the crossings last week, when Egyptian President Hosni Mubarak ordered sick and wounded people to be allowed to pass freely from Gaza to Egypt. Several thousand people have since crossed the border in each direction. Mubarak's decision came in response to pressure from Islamic parties following a clash between Israeli troops and activists who attempted to enter Gaza in defiance of a naval blockade; the activists failed and were redirected to Ashdod. Other sources say he is trying to put pressure on Israel to open the entrances to Gaza as well. Israel has allowed enormous amounts of basic goods to enter Gaza through its crossings all through the blockade period which started with the Hamas coup three years ago, but prohibits human traffic except in cases of humanitarian need. If the Rafiah crossing is opened, the closure of Israeli crossings to Gaza will not be considered a blockade under international law. The Egyptian official who announced the opening also discussed the massive barrier being constructed between Egypt and Gaza in an attempt to end smuggling. The barrier will be completed by the end of summer, and all smuggling tunnels under the border will be destroyed, he said.